Chop 1/3 cup red onion. Finely chop 1 Tbsp. of fresh rosemary. De-seed and chop one Anaheim pepper. Coarsely chop 8 oz. of Baby Bella Crimini Mushrooms. Melt 1/2 stick butter in a large skillet over medium high heat. 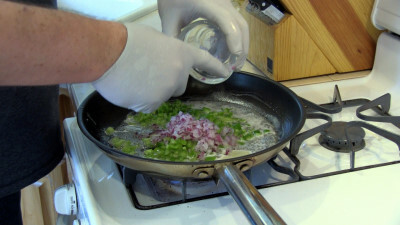 Add the red onion and Anaheim peppers. Sautee for about 1 1/2 minutes then add the mushrooms. Shake on some coarse ground black pepper to taste. 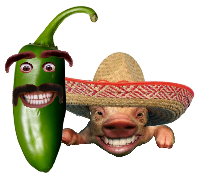 Continue to sauté until the pepper become translucent. Add 1 Tbsp. minced garlic and 1 Tbsp. chopped rosemary. Stir this in and cook for another minute. Remove from heat and set aside. Place 4 eggs in a medium mixing bowl. Next add the following. 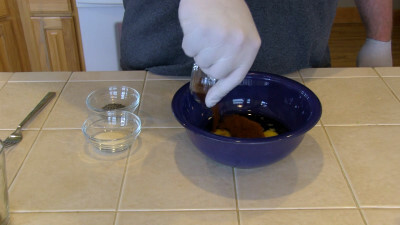 1/2 Cup Reduced Sodium Worcestershire Sauce. Place 6 lbs. 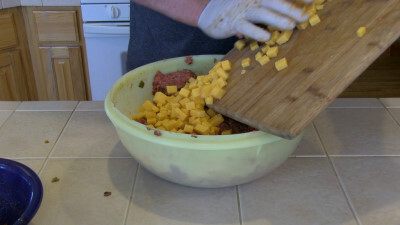 of 80/20 ground beef in a large mixing bowl. 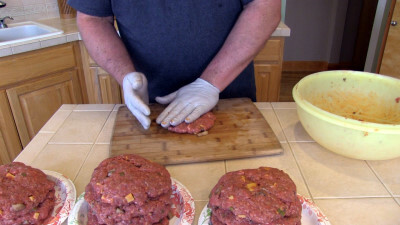 I like to poke holes all over the ground beef using my fingers to allow the liquids to get down into the meat. It makes for easier and more thorough mixing. Pour the egg mixture into the holes and over the meat. Thoroughly mix the liquid into the meat. Next dump in the cubed sharp cheddar cheese and thoroughly mix. Again thoroughly mix this into the meat. Now it's time to pre heat your cooker to 230 degrees fehrienhight. 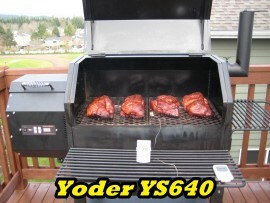 In this recipe video cooked on my Yoder YS640 using Alder pellets. 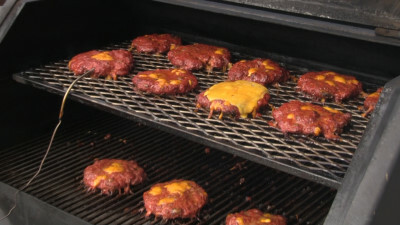 Once the burgers are formed and they have rested for 45 minutes. Place them into your pre-heated cooker and allow them to slow cook until the internal temperature reached 160 degrees. IF you wish to add cheese you should do so when the internal temp reaches 158 degrees. 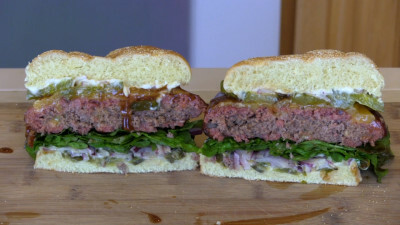 Once your burgers are done you may start the build process. Again you are building these to your liking. 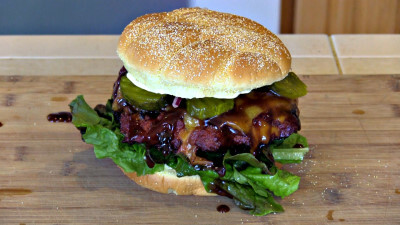 I went with mayo, Jalapeno's, red onion, red romaine lettuce and some Long Horn BBQ sauce.